Do you sometimes have the need to hoist, winch, pull, lift, lower, tension or secure a load, but a permanent type of machine is not convenient? 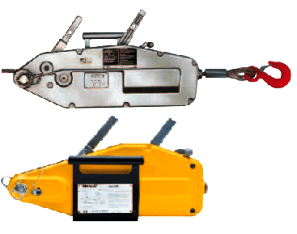 If so then one of our portable wire rope cable pullers could be the answer. Here are some details about using a cable puller and cable pulling equipment for your convenience, please call our sales team if you need any more information. A cable puller is also often referred to as a come along winch, cable pulling machine, wire puller or a wire rope cable puller. 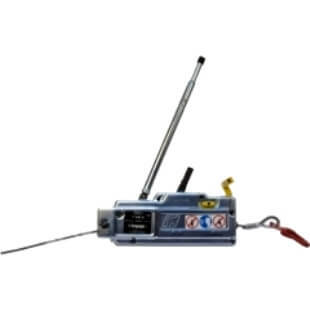 Easily transportable, cable pullers use wire rope for hoisting/winching purposes. They are an extremely adaptable piece of cable pulling equipment, as they can be used in virtually any position, vertical, diagonal, horizontal, or any other angle and with any length of wire rope. We can supply a range of cable pulling equipment from the original tirfor winch to the trusted Yaletrac with a range of load handling capacities up to 3200kg. A wire rope puller or come along winch will be extensively utilised in industrial sectors due to their numerous functions which are appropriate for building construction, farming, oil and chemical, mining and quarries and ship building industries in addition to vehicle recovery operations. Cable pullers or a wire rope puller is a perfect tool for your work vehicle. A cable puller or come along winch is a safe and reliable way of accurately moving and holding the load; you will have constant control of the operation to within just 1mm. The accuracy is due to the two jaws which grip the rope and as the lever is cranked the jaws use a hand over hand type motion to pull the rope through. Due to the self-clamping mechanism of the cable pullers jaws will give immediate and progressive grip which means the heavier the load the tighter the jaws clamp on. Most types of cable pulling machine have an easy release mechanism which enables the rope to be released effortlessly. 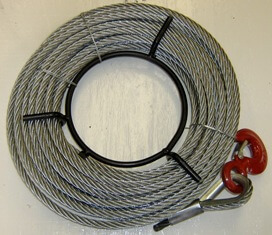 Another great benefit of the wire rope puller is that there is no limitations to the length of wire rope that it can pull through, so you could have different lengths of wire rope for different jobs but just one device, it also means that the rope is easily replaceable if it should get damaged. You should, however, use a specific type of wire rope, not just any you have lying around, the ropes recommended have specific constructions and flexibility to work correctly with the specific cable puller. Lifting Hoists Direct can supply any type of wire rope in any length to compliment your cable pullers. The total load capacity of a cable pulling machine or come along winch can be increased by the use of sheave blocks/pulley wheels. By using this method you can also change the direction of the pull/lift if necessary. Because of the increased hoisting effort when using this technique care must be taken to ensure the supporting structures and all other equipment have a sufficient capacity; you usually allow a capacity loss of around 4% per sheave. Always refer to the cable pulling equipment manufacturer’s instructions and apply the correct procedures when using the sheave block method. A wire rope cable Puller / come along winch is easy to self-maintain because the housing can normally be opened. The simple components inside the housing can be cleaned, with de-greaser if necessary and re-greased with clean oil/lubricant (do not grease grips). This will keep your cable pulling equipment in tip top condition and also keep the accuracy of the device. Most kinds of Cable pulling machine come with an overload protection device in the form of a shearing pin which can also be easily replaced if it breaks even whilst under load. The shearing pins should be checked prior to each use and replaced without delay if necessary. NEVER; use a rope with the incorrect diameter for the machine; use damaged or broken rope; extend the levers/handles; exceed the safe working load capacity. ALWAYS; check for problems before each use; store correctly; ensure suspension/anchor points are capable of taking the weight; use correct rope and handles; inspect the rope for wear, damage, or kinks. Cable pulling tools are readily available from Lifting Hoists Direct, from the wire rope to the cable pulling machine itself, all available at excellent prices and with quick delivery.